Okay, the rules of this game are simple. If you guess it right, it's your turn to give a Fact or Crap! statement. Now, here's the catch, you have to explain why it's Fact or Crap! Otherwise, your answer won't count. There's also another thing, you must wait for confirmination of your answer before you can post a Fact or Crap! statement. If this rule is broken, the statement you posted won't count. However, you will be given 24 hours to put in a new statement to redeem yourself. If you do not post a new one within 24 hours, it becomes a free-for-all (meaning anyone can give one. ), with the exception that the one who broke this rule can't post one. If you post a Fact or Crap! statement when it's not your turn, it won't count. 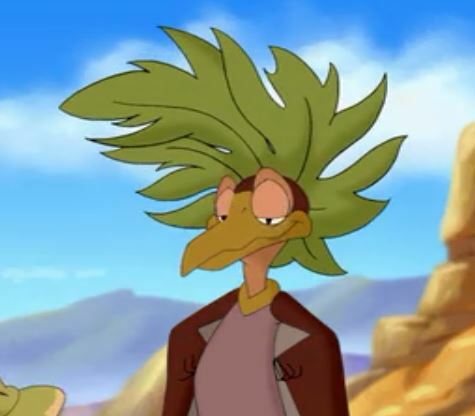 In the original LBT movie, Ducky is refered as a Duckbill. Answer: Crap! In the original movie, Ducky was refered as a swimmer by Littlefoot's mother and as a bigmouth by the narrorator. Because of all his hard work, Charles Dickens, the author of A Christmas Carol, was actually quite rich through his life. Okay, go for it guys! I think that would be a fact if you are refering to the end of his life and crap if you refer to the beginning. He started out very poor having to work in a factory as a child and being unable to attend school regularly because of his families' poverty. He worked his way up though and two years before his death he was rich enough to buy a mansion. I respect Dickens for his not forgetting about the poor when becoming successful. To this day the rich and well off often blame the poor for their poverty rather than seriously trying to help and respect them. Having this 50:50 chance for the answer I will say Crap interpreting your "through his life" to include the early life of Dickens during which he was really very poor. You are correct, Malte. I was indeed also referring to the early parts of his life. I highly doubt some readers felt that they needed 4 long paragraphs reffering of how important death was to a story. I highly doubt anyone needed that at all really. His books often show the rewards we get from the good deeds we do in life. For instance, as I saw with a South Park retelling of "Great Exceptations," it showed how a single good deed of helpping a stranger at his lowest point in life can reward you quite greatly in your later life. I can indeed understand his work quite greatly. I feel that, despite Charles Dickens actually being dead, he is one author that will never truly die. Well, since you caught me there, Malte, it's your turn. And don't forget, your statement can be ANYTHING! EDIT: Junior Post!! I'm now a Petrie. Not quite anything If one came up with statements to which one would have to answer by giving opinions rather than facts it wouldn't work out. Fact or Crap, "Benjamin Franklin's inventions include a music instrument". Fact. I believe it was called the armonica. I was going to post a picture of it but I forgot how to post images. Can someone remind me, please? Speaking of crap, that is what the weather has been doind sinse thursday. We have had a tornado outbreak and everything. Not uncommon for this time of year. See Strange Weather that I posted in th fridge. Quite right F-14. For some reason the armonica has almost been forgotten. I'm wondering what it sounds like. For all I know it is based on the same kind of sound production that creates sounds if you rub over the edge of a wine glas with a wet finger. Your turn F-14. The worst tornado in US history was the tri-state tornado in 1925 that tore across three states. By the way, whoever responds to this, please tell me how to post pictures. Please. If the term "tornado" excludes "hurricane" Katrina and if the number of deads is to be the measure on what tornado is the worst the tri-state tornado of 1925 would be the worst in US history leaving 695 people dead and more than 2000 injured. You know how to post pictures. You already did so in the favorite computer game thread. You attach the pictures to the message using the bar you will find below the post icons. You are correct. But tornados and hurricanes are two different things. A hurricane covers a large area and can last weeks. Tornados on the other hand usually spawn from thunderstorms (although thet can form at any time) and rarely last more than a few minutes and are usually pretty weak. THe tir-state tornato was one unusual exception. It lasted for houres and now some people believe it might have been several tornados. This has yet to be proven though. Alright, I know what to do now. Earlier, the "File attachment" bar was not showing up. It is now, though. It won't give me that option when I am editing a post thoigh. Why is this? Fact or Crap: By remaining in office for more than two terms US president Franklin D. Roosevelt broke the 22nd amendment of the constitution which was forgiven though because nobody wanted to change Presidents during WW2 anyway. it is indeed crap Malte as the amendment wasn't added until after FDRs death. The Amendment was passed to prevent another FDR, although Truman as the president in office when the amendment went into effect , was exempt(he could have served as many terms as he wanted). The "2 term limit' was really an tradition, rather than law. I even provided an excuse why a break of constitution might have been tolerated. Till then indeed there had been only the example Washington had set by resigning after two terms and nobody had ever considered (or at least not attempted) to go for a third term. The 22nd Amendment was passed in 1951. Your turn F-14. Here is an interesting one. Okey, someone wrote a story about a ship callet the Titan. It was to be the largest ship ever built and was said to be unsinkible. While on its first voyage, in the month of April in the North Atlantic, the ship struck an ice burg and sank. Hundreds of people died as there were not enough lifeboats for everyone. This was in a novel written 14 years before the Titanic sank so basically, someone predicted the Titanic disaster. Fact or crap? I think it's a fact. I'm not a hundred percent certain, but I'm quite sure I read something like this when Titanic came to the cinemas. I did some research and found that (at least according to some webpages) there was such a book indeed published in 1898 and written by Morgan Robertson. ^^Wow! Amazing what you can learn on the internet these days. You are correct, Malte. The book is called Futility. It came out in 1898.